Welcome to April's Meezer Musings! "Oh to be in England, now that April's there ..." runs the first line of the poem Home Thoughts from Abroad by Robert Browning. For many of us, signs of Spring are steadily appearing and now that the clocks have gone forward we have longer days and lighter evenings. I love this time of year. Bandit does too, venturing out into the garden to watch the squirrels digging up their winter stores of food, the frogs wriggling about and mating in our pond and the birds flying here and there, gathering nesting materials. 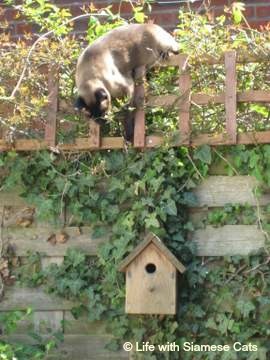 This is a photo of Bandit from some years ago exploring a nesting box. Being a rather elderly gentleman now he doesn't do as much climbing these days. Luckily there were no birds nesting in the box at the time! Bandit doesn't have a birthday. He's a rescued stray so we don't know exactly when he was born. Recently, though, I heard someone referring to the day they rescued their cat as their 'Gotcha Day' and I love this idea. Bandit first appeared in our lives on April 1st 2008 - eight whole years ago. 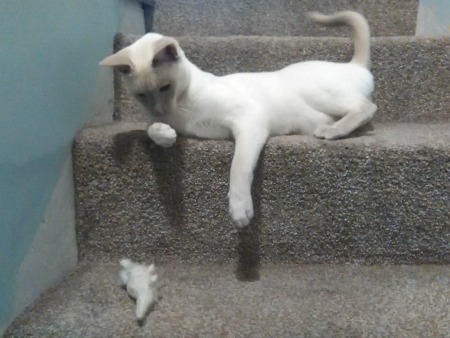 Since then I've occasionally questioned the merits of getting a Siamese cat on April Fool's Day and he's certainly led us a merry dance at times, but he's taught us so much, and brought an enormous amount of joy into our lives too. He's now around twelve or thirteen and doing well. He had his annual health check this week and the vet said he was looking very good after his health issues last year. He's put on a little (not too much!) weight and his coat is wonderfully shiny. So happy 'Gotcha' day, beautiful boy. And may there be many more! Once again, a huge thank you to everyone who took part in either Part 1 or Part 2 of our survey; your replies were all so helpful. It's going to take quite a while to sift through them and sort them into some kind of order, but I've made a start, and can see some useful material developing from your questions and concerns. The surveys will both remain open for a further week until Sunday, April 10th and will then close, so if you'd still like to take part please use the links above to do so. Incidentally, one of our readers, Lois, discovered a little 'hiccup' while she was completing part 2. She made a very lengthy comment in one of the question boxes, causing the 'Submit' button to move down and disappear off the page, where she couldn't find it. If this happens to you, just make the box a little smaller, and the 'Submit' button should magically reappear! I've been doing some editing here recently. One of our visitors, Diane, noticed our page on bathing a cat and sent in some additional tips so I've edited that page to include Diane's suggestions. 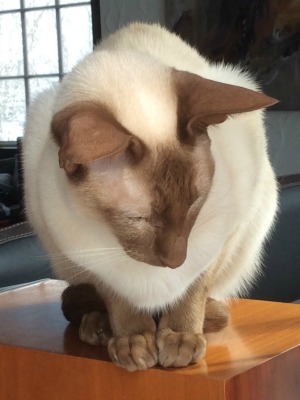 And in reply to my request for photos of Cinnamon, Fawn or Caramel points last month, two readers, Rebecca and Kate very kindly offered photos of their cats Pepé and Tristan, which have been added to our page on these rarer point colors. In honor of this, we've made Pepé and Tristan our Meezers of the Month for April. You'll see them below. I've had a few messages recently asking about settling a new cat or kitten into a household which already has one or more cats. Most of the time this isn't too much of a problem unless you have a very territorial or aggressive cat, but in all cases it's worth introducing the new cat slowly, so that all the cats have time to come to terms with the new arrangements. Here are some steps to follow if you're introducing a new cat into your house. Take your time with each step and start each one several days apart. Keep the new cat separate. Keep it confined to one room of the house with everything it needs (food, water, litter tray, toys, warm bed). It will feel safe, and your existing cat or cats won't feel threatened. Exchange smells. Rubbing your new cat with your existing cat's blanket and vice versa, or getting them to sleep on each other's blankets, will help both cats get used to each other's smells while they're still separated. Swap territories. Once your new cat's more or less settled, confine your existing cat into one room (preferably not the room you've allocated as the 'safe house' for the new cat). Then allow the new cat out to explore the rest of the house, making sure all doors and windows are closed and keeping an eye on it so that it doesn't get accidentally lost! This will help distribute the new cat's smell around the house. Feed them together, but apart. Feed your new cat in its 'safe room' with the bowl near the door, keeping the door closed. Then feed your existing cat outside the closed door. They'll be able to smell but not see each other, and get used to being fed near one another. Introduce them. Once you've completed the above (preferably all the steps and in the right order!) allow your cats to come together, but don't leave them unsupervised until you're sure they don't fight. If things don't go exactly as planned and things are stressful, invest in a pheromone spray or plug-in like Feliway Multicat (available on Amazon) which will help to keep the cats and the atmosphere calm and peaceful. 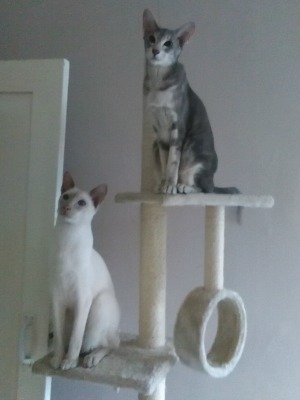 We have two Meezers of the Month for April. You may remember that last month I put out a call for photos of Cinnamon, Caramel or Fawn point Siamese, and had two replies and some lovely pictures! First up is Rebecca Wood's Pepé, who you can see below left (and on the right with his Oriental sister Mowgli). Pepé is a Fawn point Siamese, which, along with Cinnamon and Caramel, is one of the newer point colors. Below left we have Kate Wood-Kaiser's Tristan, a fabulous Cinnamon point. Kate says Tristan's very shy (and hates medication, but then, don't they all!) He does love cuddling with his family though, and here he is with his Balinese buddy Charlie. Our Fun from Facebook feature this month features Bram van Damme's tortie point Peach, who's pretending to be either a cockerel or a lion! Only she knows, but either way it's a wonderful photo, caught at just the right moment. 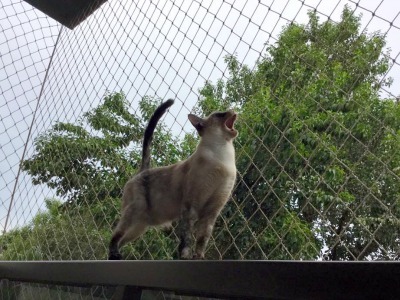 In case you're wondering about the enclosure, I asked Bram about it myself and he told me that the wire netting completely encloses a balcony (you can just see the roof of the balcony, top left) which allows their cats some outdoor fresh air and sunshine, while remaining completely safe. Peach certainly seems to be enjoying it! That's it from us for this month. Next time I'll be starting to answer some of the questions from the surveys. Don't forget that both surveys will close on Sunday April 10th, so if you haven't completed them and would still like to do so, here they are. See you in May! Have a great month with your Meezers till then.